Eye, Cornea - Ulcer in a male B6C3F1 mouse from a subchronic study. 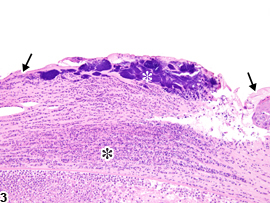 There is denudation of all layers of the corneal epithelium (arrow). 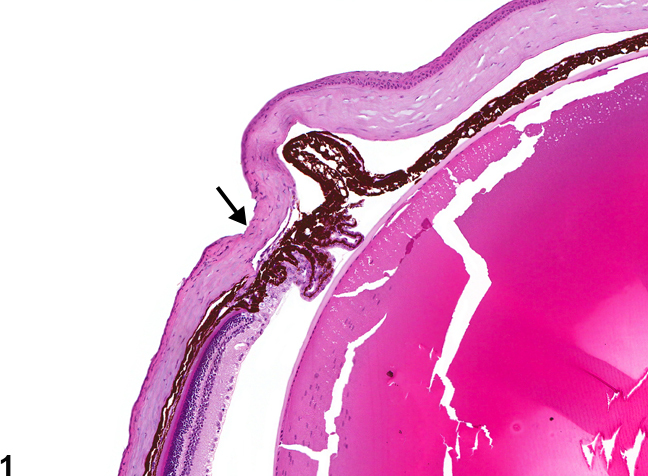 Eye, Cornea - Ulcer in a male B6C3F1 mouse from a subchronic study (higher magnification of Figure 1). 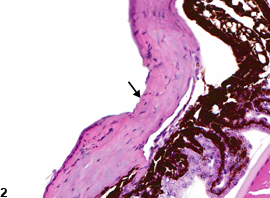 All layers of the corneal epithelium have been lost, exposing the underlying stroma (arrow). Eye, Cornea - Ulcer in a male F344/N rat from a subchronic study. Large corneal ulcer (bounded by arrows) colonized by numerous coccoid bacteria (white asterisk) and associated with underlying suppurative inflammation (asterisk). Erosion and ulceration can occur in the corneal epithelium (lining the anterior surface of the cornea). They are characterized by focal denudation of all layers of the corneal epithelium, including the basal lamina ( Figure 1 and Figure 2 ). Ulcers typically incite an inflammatory reaction, which varies with the chronicity of the lesion. Bacteria may colonize the ulcerated region, which usually incites a suppurative inflammatory reaction ( Figure 3 ). Corneal epithelial ulceration and erosion can result from many causes, including physical trauma, contact with irritating chemicals via direct topical administration, contact with systemic toxicants secreted by the lacrimal glands into the precorneal tear film, exposure to ionizing radiation or excess ambient light, and reduced blinking reflex or eyelid closure due to prolonged anesthesia or deficits of eyelid innervation. Corneal epithelial ulcers and erosions can also be sequelae of corneal inflammation or alterations in the precorneal tear film composition due to lacrimal gland disease. Although less common than epithelial changes, ulceration of the single-layered corneal endothelium (lining the posterior surface of the cornea) can also occur. Corneal epithelial erosions, in which there is partial epithelial denudation with retention of an intact basal lamina, are similar lesions, though typically less extensive. Corneal ulcers and/or erosions should be diagnosed and assigned a severity grade. An appropriate subtopography modifier (e.g., epithelium, endothelium) should be includedd in the diagnosis. If both ulcers and erosions are present in the same animal, the most severe lesion (ulcer) should be diagnosed. If both ulcers and erosions are diagnosed in the same study, the fact that they are part of the same pathologic process should be discussed in the narrative. Associated lesions such as inflammation and necrosis should not be diagnosed separately, unless warranted by severity, but should be described in the pathology narrative. Greaves P. 2007. Nervous system and special sense organs. In: Histopathology of Preclinical Toxicity Studies: Interpretation and Relevance in Drug Safety Evaluation, 3rd ed. Academic Press, San Diego, CA, 861-933. Kast A. 1991. Keratoconjunctivitis sicca and sequelae, mouse and rat. In: International Life Sciences Institute Monographs on the Pathology of Laboratory Animals, Vol 10, Eye and Ear (Jones TC, Mohr U, Hunt RD, eds). Springer, Berlin, 29-37. Lai Y-L, Jacoby RO, Bhatt PN, Jonas AM. 1976. Keratoconjunctivitis associated with sialodacryoadenitis Invest Ophthalmol Vis Sci 15:538-541. Lennikov A, Kitaichi N, Fukase R, Murata M, Noda K, Ando R, Ohguchi T, Kawakita T, Ohno S, Ishida S. 2012. Amelioration of ultraviolet-induced photokeratitis in mice treated with astaxanthin eye drops. Mol Vis 18:455-464. Maurer JK, Parker RD. 1996. Light microscopic comparison of surfactant-induced eye irritation in rabbits and rats at three hours and recovery/day 35. Toxicol Pathol 24:403-411. National Toxicology Program. 2009. NTP TR-549. Toxicology and Carcinogenesis Studies of Bromochloroacetic Acid (CAS No. 5589-96-8) in F344/N Rats and B6C3F1 Mice (Drinking Water Studies). NTP, Research Triangle Park, NC. Xue ML, Wakefield D, Willcox ADP, Lloyd AR, Di Girolamo N, Cole N, Thakur A. 2003. Regulation of MMPs and TIMPSs by IL-1β during corneal ulceration and infection. Invest Ophthalmol Vis Sci 44:2020-2025.